Forensic anthropologist Bill Bass is among the most famous Americans in his field, which is the use of physical anthropology to resolve medical and criminal matters about the dead. He is the former director of the University of Tennessee's Forensic Anthropology Center (FAC), a two-acre compound known colloquially as "The Body Farm", where human remains are left to decay in various natural and controlled environments. 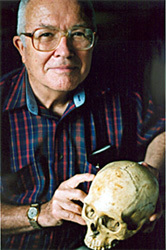 At the FAC, the world's only laboratory devoted to the study of human decomposition, Bass's research has helped provide the basis that allows crime scene investigators to determine, among myriad other details, the cause of death in cases where police are working with victims' skeletal remains, or the time of death, based on such factors as the number and size of insects or the rate of flesh and organ rot. His research has also yielded unexpected results — for example, Bass has found that the smell of cancer victims' corpses is distinctly different from the scent of victims of other natural causes, and that maggots feeding on the body of recreational drug users can be chemically distinguished from maggots feeding on abstainers.